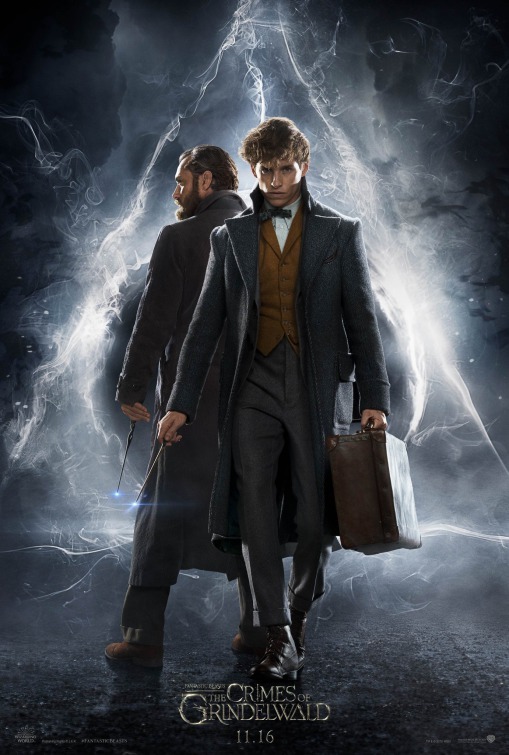 "Weak Plot Development and Messaging"
In FANTASTIC BEASTS: THE CRIMES OF GRINDELWALD, Newt Scamander and his friends try to stop a dark wizard who’s trying rally his own supporters to help him establish a new world order where wizards rule over non-magical people “for the greater good.” Despite some entertaining and exciting moments, the plot and messages in THE CRIMES OF GRINDELWALD are sometimes a bit weak and display an occult worldview with some strong and scary violence involving magic. In FANTASTIC BEASTS: THE CRIMES OF GRINDELWALD, Newt Scamander and his friends try to stop a dark wizard who’s trying rally his own supporters to help him establish a new world order where wizards rule over non-magical people “for the greater good.” The plot and messages in THE CRIMES OF GRINDELWALD are sometimes a bit weak and display an occult worldview with some strong and scary violence involving magic. The movie opens with the dark wizard Grindelwald escaping custody and fleeing to Paris. Meanwhile, Professor Dumbledore enlists the aid of Newt Scamander, a wizard with a talent for healing and training magical beasts, to travel to Paris and discover what exactly Grindelwald is planning. In Paris, Newt meets up with his non-magical friend from New York, Jacob, who’s been enchanted by his magical girlfriend, Queenie. Queenie wants to marry Jacob, but Newt convinces her that Jacob needs to make up his own mind about that. However, when Queenie ends her spell on Jacob, Jacob says he doesn’t want to get married because, if they get married, the Ministry of Magic will put her in jail for marrying a non-magical person. This just makes Queenie mad, and she leaves, only to be seduced by Grindelwald to join his movement to rule the world. THE CRIMES OF GRINDELWALD is the second of five planned movies. Like a couple of the previous Harry Potter movies, the plot is sometimes a little confusing. For example, an explanation of why the villain is trying to locate the young man who wants to find his birth mother is not revealed right away, and the explanation doesn’t make much sense. Also, although the villain is clearly not above killing other people to accomplish his goals, the jeopardy in the movie is rather static until the end when the villain holds a rally of his followers to announce his intentions to the wizarding world. Even then, most of this sequence involves the villain making a speech about the technological dangers of non-magical people, especially their weapons of war. The messages in THE CRIMES OF GRINDELWALD are also a little confusing. The movie has a strong occult worldview, mitigated by some moral, redemptive elements. This combination is confusing because, on its face, the villain’s argument that the wizarding community should be fearful about the technological dangers of non-magical people makes sense. At another point in his speech at the rally, the villain makes an argument that wizards and witches should not be forced to hide who they are and that they should be able to love who they want to love. That’s the kind of thing we often hear today, but the movie itself? Of course, when it becomes clear that the villain believes the ends justify the means, it also becomes more clear why he should be stopped. This clarity, however, doesn’t make for a very dramatic premise. Ultimately, the occult worldview of the Harry Potter universe lacks a biblical foundation. Consequently, it can’t really offer viewers a consistent ethical foundation for its battles of good wizards versus evil wizards. Thus, while THE CRIMES OF GRINDELWALD takes a stand for life against death and questions all-encompassing plans to rule the world “for the greater good,” its argument seems too superficial and undeveloped. FANTASTIC BEASTS: THE CRIMES OF GRINDELWALD contains some strong and scary violence, with scary characters and scary creatures. For example, a young woman transforms into a large snake in one scene. In addition to the implied references to Dumbledore’s past homosexual feelings for Grindelwald, there’s one light obscenity. Finally, a story is told about a man who fancied his employer’s beautiful wife and murdered the employer to obtain her. In effect, this story is the “original sin” that sets in motion a major plot development in the movie, similar to Cinderella’s widowed father marrying a greedy shrew or Darth Vader joining the Dark Side and murdering Luke’s aunt and uncle in the original STAR WARS movies. Villain seduces a character to join his cause out of a sense of revenge, revenge also motivates another character, little girl switches her crying baby half-brother with another woman’s baby, young woman turns into a large snake. FANTASTIC BEASTS: THE CRIMES OF GRINDELWALD opens with the dark wizard Grindelwald escaping and fleeing to Paris. Meanwhile, Professor Dumbledore enlists Newt Scamander, a wizard with a talent for healing and training magical beasts, to travel to Paris and discover what exactly Grindelwald’s planning. It’s soon revealed that Grindelwald wants to enlist the help of the young wizard from the first movie, Credence, who’s searching for his birth mother who disappeared when he was adopted. Grindelwald believes Credence is the only person who can kill Dumbledore for him. THE CRIMES OF GRINDELWALD is the second of five planned movies. The plot and messages in THE CRIMES OF GRINDELWALD are sometimes a bit weak. The movie’s moral premise should have been stronger and more dynamic. The movie also has a strong occult worldview, mitigated by some moral, redemptive elements, but the positive elements never take off and soar. Perhaps, the filmmakers should have planned to make only three movies. FANTASTIC BEASTS: THE CRIMES OF GRINDELWALD contains some strong and scary violence. There’s also a hint about Dumbledore’s past homosexual feelings for the villain.